Crazy, huh? 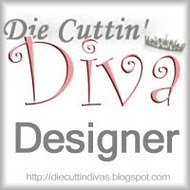 Not so much---hop on over to Die Cuttin' Divas to see all the great cards the Diva Design Team has made for some inspiration! We hope you'll join the challenge this week. Create a Valentine-themed card, layout, or project using non-traditional colors -- no pink or red, please. Be sure to use a die cut and link your post back to the DCD blog site. Can't wait to see what you create! Thanks for stopping by, appreciate your visit! Very pretty card, Pat!! I love the color you used! Have a great day. Love it Pat, Orange is such a HAPPY color and I love that sentiment too! Such a sweet sentiment!! Super Duper Cute!! What a cute card, I really like the gingham paper and the colors you c hose! Thanks for joining FCCB's "I Heart You" challenge this week! Love, love, love the color (orange is one of my favorites) and gingham always looks so fresh! Very fun paper and card design. Me again...thanks for playing along with us at PDE Crafty Linky Party!! this is adorable!!! Thanks for joining the Wacky Wednesday Challenge!